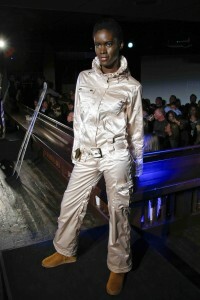 The first-ever Aspen Fashion Week will shine a spotlight on the booming skiwear industry from March 1-5, 2009. Aspen Fashion Week will serve as a consumer showcase and industry marketplace for winter sports products, a fast-growing sector that took in nearly $3 billion last year, including $661 million in apparel, $663 million in accessories, and $571 million in equipment sales, according to Snowsports Industry of America. The first-ever Aspen Fashion Week put a spotlight on the booming skiwear industry with four days of special events, including a kick-off party hosted by W magazine, an exclusive screening of the acclaimed documentary, VALENTINO: THE LAST EMPEROR, and runway events featuring 2009/2010 winter, ski and snowboard collections from Moncler, Fendi, Rossignol, Ed Hardy SNOW, Under Armour, Obermeyer, and Isaora. Coverage included: WWD, Vanity Fair, Luxist, Fashion Week Daily, Huffington Post, VIV Mag, Aspen Peak, Fashion Rules!, Aspen.com, Aspen Daily News, and Ski Resorts. PKPR secured a great segment for Lisa Johnson, the founder of Aspen Fashion Week, on Good Morning America Now to discuss how to get the season’s top ski looks for less. You can watch it online here.